Melbourne Stars are set to host Sydney Sixers for the final league game of the Big Bash League 2018-19. The final league fixture will be played at the iconic Melbourne Cricket Ground (MCG). Both sides will collide with each other for the second time this season with Melbourne Stars emerging victorious in their previous encounter by five wickets. Peter Handscomb starred in that game with the bat, scoring 70 off 35 balls to take his side over the line. Having lost both of their last two games, Melbourne Stars find themselves at a tricky position. This will be a do-or-die situation for the home side as they have to defeat the Sixers in their last league game in order to qualify to the semi-final round. The Stars are currently sitting at the sixth spot with 12 league points to their name. If they emerge victorious in the upcoming match, Melbourne Stars will face Hobart Hurricanes in the semi-final match. On the contrary, Sydney Sixers are comfortably sitting at the second spot in the table. They have managed to claim 16 league points from their 13 outings. Sixers won the Sydney derby against the Thunders by 9 wickets in their last match and they would be hoping to beat their opponents in the upcoming match and secure their second position. Having won their last four games on the trot, Sydney Sixers are firm favourites in the upcoming match. - They have declared an unchanged 13-man squad. SQUAD | We've named an unchanged 13-player squad for our match v Sixers tomorrow at the @MCG. Play starts at 2.45pm. - They have announced a 13-man with one change. - Nathan Lyon can feature in the playing 11 to replace Lloyd Pope. Plus, we crunch the numbers on what's needed for us to secure a home semi-final at the @scg! Glenn Maxwell (C), Jackson Bird, Dwayne Bravo, Jackson Coleman, Ben Dunk, Seb Gotch, Evan Gulbis, Peter Handscomb, Sandeep Lamichhane, Nic Maddinson, Marcus Stoinis, Dan Worrall, Adam Zampa. Sean Abbott, Tom Curran, Ben Dwarshuis, Jack Edwards, Mickey Edwards, Moises Henriques, Dan Hughes, Nathan Lyon, Steve O’Keefe, Josh Philippe, Lloyd Pope, Jordan Silk, James Vince. Melbourne Stars: Ben Dunk, Marcus Stoinis, Peter Handscomb(w), Glenn Maxwell(c), Nic Maddinson, Seb Gotch, Dwayne Bravo, Jackson Bird, Daniel Worrall, Sandeep Lamichhane, Adam Zampa. 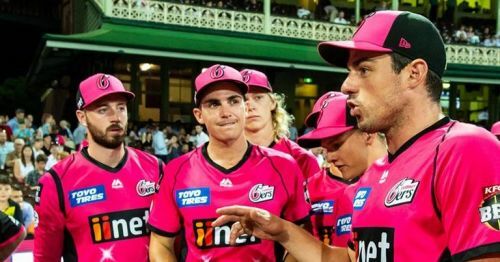 Sydney Sixers: Daniel Hughes, Josh Philippe(w), James Vince, Moises Henriques(c), Jordan Silk, Jack Edwards, Tom Curran, Sean Abbott, Steve OKeefe, Ben Dwarshuis, Lloyd Pope/Nathan Lyon.